Ever wish you could easily turn your bright idea into a marketable invention? Or that your recipes were digitally organized? Or that online auction buying were as simple as a tweet? There's a website for that - and we've broken them all down for you. KitchenMonki.com is a recipe finder, meal planner, and shopping list generator all in one. Whether it's a pile of food-splotched printouts or a cluttered digital desktop, many cooking enthusiasts are swimming in recipes, with no good system for storing them. Is there a better way to collect and store recipes so they can be easily retrieved later on? Leadership Historic Triangle has launched an online healthy recipe exchange and giveaway. Making grocery lists and sticking to them saves money and guards against impulse buys, except, of course, when you forget them at home, which can happen to the best of us. My dream finally a reality via @KitchenMonki! KitchenMonki has a new, free web tool that sends an aisle-by-aisle list to your phone, helping you navigate to find the items you need without scanning every aisle. Kitchen Monki is an online community where users can make friends, create grocery lists, discover great recipes and more. The site was founded by Sam Kinney as a way of integrating his passions. Users of the recently launched website Kitchen Monki can enter and save recipes and then click to generate a shopping list of ingredients. Is Kitchen Monki The Complete Recipe Management Website You Were Looking For? Are you looking for a way to make family meal planning easier? I have been. I have and older recipe book / menu planner for my computer, but it's interface isn't all that intuitive and it's been giving me fits trying to run it on Windows Vista. Recently, I ran across a brand new web site called Kitchen Monki. This site offers a one-stop shop for meal planning and recipe management, and I have to say at first glance it looks like they are off to a fantastic start. Kitchen Monki is a meal planner, an organizational tool, a recipe archive, a vibrant social media community and so much more. I bumped into these friendly folks on Twitter and the name alone peaked my fascination. Sometimes it's hard to keep up. Between seemingly daily San Francisco restaurant openings and brand new food websites, it seems like change is a constant. And like all things, some of those additions are good and some--not so much. Meal planning, like budgeting and clipping coupons is one of those tasks that I always groan at. However, meal planning does make a mom’s life easier, not just in knowing what to make for dinner each night, but in grocery shopping as well. If you think the only way to search the interwebs for your favorite foods is by tapping keywords into Google, well, think again. Mission: Build an online food community and make cooking easier for all. Kitchen Monki is a new website dedicated to helping home cooks organize recipes, manage grocery lists and find foodie resources. The website, founded by Sam Kinney, a Seattle native and Eastside resident and single father to three boys. Kitchen Monki co-founder Sam Kinney starts our interview by addressing the most obvious question. Why in the world are so many Seattle area Internet companies -- from Allrecipes.com to Foodista -- trying to help people find recipes to cook? Technology Expert Sarah Kimmel shows us how to harness the new online tools for your own good. [Kitchen Monki] is a great website that lets you use tools to plan your menu, pick out recipes, and even send the grocery shopping list to someone else's phone so they can pick up the ingredients on their way home. Make cooking and grocery shopping more enjoyable by using this resource which will allow you to create and share your recipes, as well as create shopping lists and have them sent to your mobile phone. Munduari So! "KitchenMonki: Erresetak bilatu eta partekatu"
Sabor Universal: "Comparte recetas online con Kitchen Monki"
Try the Monki--a refreshing alternative to "don't touch the Monkey"
"What my internet bot filled life has been missing (and mourning) is a way to make a shopping list from a recipe and then save it--all online, all accessible from the mobile device of my liking... Today: I found it--or at least the Beta version of it--in Kitchen Monki. It is everything and more that I would want (it even links to facebook if you so desire) Try it--I will be for the next 5.2 minutes and believe me: if it fails the test you will hear that too--otherwise I will be happily integrating my somewhat meager recipe collection and making list after list--just for list sake--"
WKRQ Cincinatti program, "Amy's Table with Amy Tobin: On the Radio - Sam Kinney and Kitchen Monki"
KOMO Newsradio Seattle program, "Side Dish: Kitchenmonki"
"I came across this great new site on facebook and joined. Its free.....You can look up recipes, post your own, mingle with other cooks and so much more...I had great interaction with the moderator and this is a wonderful site! I hope to see you on KitchenMonki!" 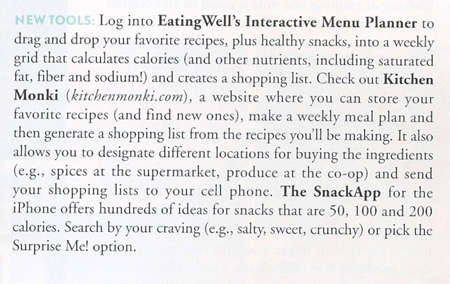 Angela tuener's Technology Review: "Kitchen Monki – Planning meals and shopping"
Planning meals and shopping are two things that most of us do not enjoy doing, but the kitchen Monki provides a smooth interface to be a little easier. easier. After you sign into Kitchen Monki, you can find and share recipes, make a meal plan, and create a shopping list from the ingredients in your queued recipes or by manually adding items. When it's time to go shopping, you can print out your list or bring it up on your mobile phone." Vegan Once-A-Month Cooking: "Making Your Own Menu"
It sounds excellent - you should be able to just decide what recipes you want to make for the month, click the ingredients needed, and then get a grocery list created by the site. Much smoother than the method I use, which is filled with tallies and annotations and a lot of things crossed off by hand as I change my mind about recipes. "Here's something I stumbled upon today: Kitchen Monki. Kitchen Monki lets you create shopping lists from your recipes and send them directly to your phone- or your husband's phone- and then check off the items as you shop. LOVE this!" KitchenMonki is super easy to signup for and, through their Facebook app, to share with your friends. I have been cooking a lot more lately and I find KitchenMonki is a fun way to tell my friends what I've been making, try their recipes and keep track of the successful endeavors I have in the kitchen. Tip-top Tweeters and first-rate Friends, the Monki salutes you! Wow! Super impressed with Kitchen Monki. Was just saying to my family that I could not find a programme that would let me put my own recipes in, let me plan a calendar of meals, then print a shopping list. Kitchen Monki ticked every box (and in metric!) - thank you so much! So excited I found Kitchen Monki I could cry. Is that weird? Monki in the kitchen. http://www.kitchenmonki.com/ Reason 1 why I need to buy a laptop for permanent stationing in the kitchen. Whenever my 3 year old daughter see a Kitchen Monki printout she runs around the room saying KITCHEN MONKI KITCHEN MONKI. It's pretty cute. WOO HOO! FINALLY something that isn't reserved for iPhone users! I LOVE you, Mr.Monki! I'm getting hooked up! KITCHEN MONKI! Where have you been all my life????? OMG! I LOVE this tool!